Explore hidden gems such as Food Tours and Palatine Hill. There's much more to do: steep yourself in history at Colosseum, get to know the fascinating history of Piazza Navona, explore the world behind art at Vatican Museums, and take in the architecture and atmosphere at Santa Maria in Trastevere. To see more things to do, photos, ratings, and more tourist information, use the Rome trip planner . Sydney, Australia to Rome is an approximately 24-hour flight. You can also do a combination of train and flight; or do a combination of bus and flight. Due to the time zone difference, you'll gain 9 hours traveling from Sydney to Rome. Traveling from Sydney in April, you can expect nighttime temperatures to be little chillier in Rome, with lows of 11°C. Finish your sightseeing early on the 30th (Tue) to allow enough time to take a train to Florence. Step off the beaten path and head to Torre di Pisa and Siena Cathedral. Step out of Florence to go to Siena and see Piazza del Campo, which is approximately 1h 15 min away. Dedicate the 5th (Sun) to wine at some of the top wineries in the area. There's still lots to do: make a trip to Piazza della Signoria, examine the collection at Pitti Palace, contemplate in the serene atmosphere at Cathedral of Santa Maria del Fiore, and pause for some photo ops at Campanile di Giotto. To find where to stay, ratings, traveler tips, and other tourist information, read our Florence online trip itinerary planner . Traveling by train from Rome to Florence takes 2 hours. Alternatively, you can drive; or fly. In April in Florence, expect temperatures between 22°C during the day and 11°C at night. Cap off your sightseeing on the 5th (Sun) early enough to travel to Barcelona. Discover out-of-the-way places like Casa Mila - La Pedrera and La Boqueria. There's lots more to do: admire the landmark architecture of Basilica of the Sagrada Familia, explore and take pictures at Camp Nou, examine the collection at Casa Batllo, and make a trip to Las Ramblas. For reviews, where to stay, traveler tips, and tourist information, use the Barcelona journey planner . Traveling by flight from Florence to Barcelona takes 4.5 hours. Alternatively, you can do a combination of train and flight; or drive. May in Barcelona sees daily highs of 25°C and lows of 16°C at night. Finish up your sightseeing early on the 8th (Wed) so you can travel to Lisbon. Step off the beaten path and head to Park and National Palace of Pena and Padrao dos Descobrimentos. Get out of town with these interesting Lisbon side-trips: Sintra (Sintra National Palace & Quinta da Regaleira). There's still lots to do: take a stroll through Belém Tower, tour the water at your own pace with Rent a Boat, meet the residents at Lisbon Oceanarium, and examine the collection at National Tile Museum. To find maps, more things to do, where to stay, and other tourist information, use the Lisbon trip builder tool . Fly from Barcelona to Lisbon in 5 hours. Alternatively, you can do a combination of train and bus; or drive. The time zone difference when traveling from Barcelona to Lisbon is minus 1 hour. In May in Lisbon, expect temperatures between 28°C during the day and 15°C at night. Finish up your sightseeing early on the 12th (Sun) so you can travel to Dublin. Discover out-of-the-way places like Walking tours and Trinity College Dublin. There's lots more to do: tour the pleasant surroundings at St. Stephen's Green, get lost in a book at The Book of Kells and the Old Library Exhibition, don't miss a visit to Merrion Square, and see the interesting displays at Kilmainham Gaol. To find maps, where to stay, ratings, and more tourist information, go to the Dublin trip planning site . You can fly from Lisbon to Dublin in 6 hours. Another option is to do a combination of bus, train, and ferry. In May, Dublin is slightly colder than Lisbon - with highs of 17°C and lows of 7°C. 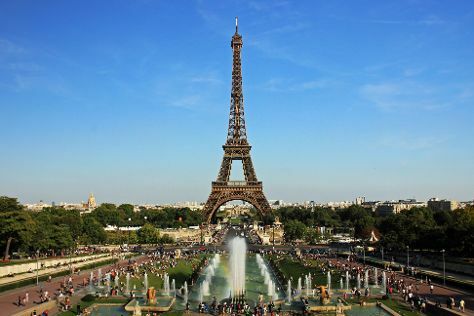 Wrap up your sightseeing on the 16th (Thu) early enough to travel to Paris. Step off the beaten path and head to Luxembourg Gardens and Sainte-Chapelle. There's lots more to do: enjoy breathtaking views from Eiffel Tower, explore the world behind art at Musee d'Orsay, admire the striking features of Basilique du Sacre-Coeur de Montmartre, and browse the exhibits of Louvre Museum. To see photos, other places to visit, maps, and tourist information, refer to the Paris route tool . Traveling by flight from Dublin to Paris takes 5 hours. Alternatively, you can do a combination of flight, bus, and train; or do a combination of flight and shuttle. You'll lose 1 hour traveling from Dublin to Paris due to the time zone difference. Plan for somewhat warmer nights when traveling from Dublin in May since evenings lows in Paris dip to 11°C. Finish your sightseeing early on the 20th (Mon) so you can take a train to Brussels. 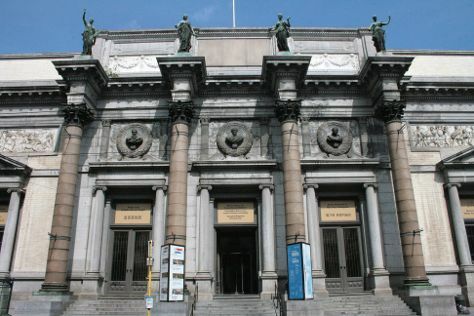 Brussels is known for historic sites, museums, nightlife, shopping, and theme parks. Your plan includes some of its best attractions: steep yourself in history at Grand Place, examine the collection at Horta Museum (Musee Horta), appreciate the history behind Manneken Pis, and make a trip to Atomium. To see traveler tips, maps, ratings, and more tourist information, use the Brussels tour itinerary planning app . Getting from Paris to Brussels by train takes about 1.5 hours. Other options: fly; or drive. In May, daily temperatures in Brussels can reach 19°C, while at night they dip to 8°C. Wrap up your sightseeing on the 23rd (Thu) early enough to take a train to Amsterdam. Step off the beaten path and head to Vondelpark and The Jordaan. The adventure continues: explore the world behind art at Rijksmuseum, get curious at NEMO Science Museum, tour the water at your own pace with Flying Dutch Boats, and admire nature's wide array of creatures at ARTIS. For other places to visit, reviews, and tourist information, read Amsterdam trip planner . Traveling by train from Brussels to Amsterdam takes 2 hours. Alternatively, you can drive; or fly. In May, plan for daily highs up to 20°C, and evening lows to 10°C. Finish your sightseeing early on the 27th (Mon) to allow enough time to travel to Vienna. You'll discover tucked-away gems like Belvedere Palace and Schonbrunner Gardens. Pack the 31st (Fri) with family-friendly diversions at Prater. There's still lots to do: admire the natural beauty at Schonbrunn Palace, explore the world behind art at Kunsthistorisches Museum Wien, admire nature's wide array of creatures at Schönbrunn Zoo, and browse the eclectic array of goods at Vienna Naschmarkt. For where to stay, maps, more things to do, and more tourist information, use the Vienna day trip planning site . Fly from Amsterdam to Vienna in 4.5 hours. Alternatively, you can do a combination of train and flight; or drive. In May, daytime highs in Vienna are 22°C, while nighttime lows are 11°C. Finish your sightseeing early on the 31st (Fri) to allow enough time to travel back home.